Since PX4 uses the MavLink Protocol as well, in theory the same solution should work for the PX4 flightstack as well. But unfortunatly it does not work. Can someone please tell me how to configure that for PX4? Can I use QGC to configure both Telem-Ports on the Pixracer? I know that Pixracer has a dedicated FrSky Interface but it only provides a very limited number of interesting telemetry data values whereas this solution reads about 21 sensors/values. 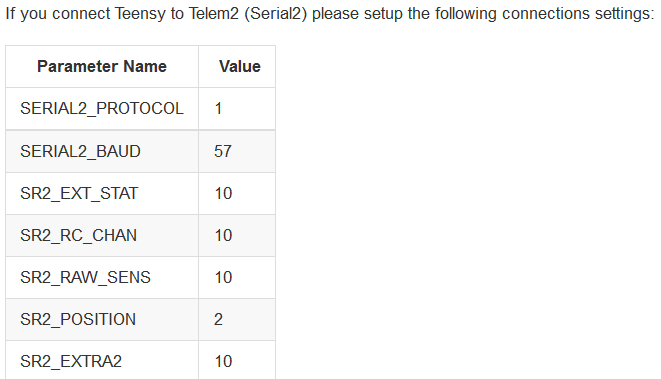 @kd0aij Might be interesting to look at what is missing in terms of telemetry values. How the FrSky "sensors" are named and what data is feed to them via the Teensy MavLink->FrSky transcoder can be derived from the project Wiki as well. So far this is the most advanced Telemetry solution for Taranis yet. Using it is really really convenient and fun. I would hate to have to go back and flash Arducopter again in order to use it. @LorenzMeier: In the meanwhile - Is there a way to configure the TELEM1 or 2 -Port on PX4 accordingly to the desired settings like in Arducopter? Since both speak "MavLink" this must somehow work. The docs were lacking, I created this page - does that help? Thank you for complementing the documentation. Unfortunatly it did not help. As far as I understood these settings affect the TL2 Port on the Pixracer board only (TL1 unaffected). I tried all 5 settings without success. As far as I understand the Teensy initially polls the flightcontroller to send specific parameters via MavLink. I can see this initial request via the LED briefly lighting up on the Teensy. Then nothing happens anymore. OSD and MavLink Control Uplink do not work at all with PX4 yet - regardless which of the 5 presets we tried. Correct cabling and connections have been double checked already. Wouldn't it make sense to implement a 100% Arducopter compatible/identical way to configure the serial Ports for PX4? There are tons of MavLink peripherals out there which need very specific parameters and settings in order to work properly. I am not sure if one can give good coverage for all those solutions with 5 presets? Many Thanks for the excellent Support and Help in Advance! I use the Teensy solution as well and couldn't set it up. I flashed my auav-x2, witch has a full functioning teensy system with the px4 firmware and the telemetry still work perfectly. Only downside is that the lua script is for apm so I don't get the flightmode back to my taranis from the fc. But everything else (bat, gps, hdop, etc...) is displayed on my taranis. I don't know on the pixracer, but with the Firmware it worksfine! After booting, the app is not running. Started manually a D-type receiver is detected, although a X8 receiver is connected. SYS_COMPANION is set to Telemetry. With APM firmware hardeware works perfec tly. Can anyone tell me where this has been left off? I have a prototype I need to build using this PixRacer if possible. I need to run Crossfire (900mhz) and 2.4g video. I need to have video (using ezcap) and telemetry sent back to Mission planner (using Bluetooth on Crossfire). Is this all possible with the Pix Racer or should I movbe up to PixHawk? Its needed to be in a small platform. Meanwhile i use arduplane firmware instead of px4-stack for a long time. With arduplane Mavlink via Crossfire works as well as Frsky telemetry on Pixracer. Since I have no 2.4GHZ Crossfire FPV equipment, I can not comment on that.